The graceful Wood Stork (mycteria americana) is a large American wading bird in the stork family Ciconiidae. It was formerly called the "Wood Ibis", though it is not really an ibis. As of August 28, 2013 it is classified as an endangered species by the U.S. Fish & Wildlife Service, although there have been proposals to down list it to threatened. This is a subtropical and tropical species which breeds in much of South America, Central America and the Caribbean. The Wood Stork is the only stork that presently breeds in North America. In the United States there is a small and endangered breeding population in Florida, Georgia, and South Carolina, along with a recently discovered rookery in southeastern North Carolina. On the other hand, in Santa Catarina state (Brazil), its decline seems to have been reversed: after an absence between the late 1960s and the mid-1990s, the species is now again regularly encountered there, in particular in the Tubarão River region. It is likely that the Paraná River region's wetlands served as a stronghold of the species, from where it is now re-colonizing some of its former haunts. Globally, it is considered a Species of Least Concern by the IUCN due to its large range. The adult is a large bird which stands 83–115 cm (33–45 in) tall and spans 140–180 cm (58–71 in) across the wings. Males typically weigh 2.5–3.3 kg (5.5-7.3 lbs); females weigh 2.0–2.8 kg (4.4-6.2 lbs), although large males can weigh up to 4.5 kg (10 lbs). It appears all white on the ground, with blackish-gray legs and pink feet. In flight, the trailing edge of the wings is black. The head is dark brown with a bald, black face, and the thick down curved bill is dusky yellow. Juvenile birds are a duller version of the adult, generally browner on the neck, and with a paler bill. The bare head and the long bill, which can measure up to 25.5 cm (10.0 in) in length, render the Wood Stork distinctive from other large waders in its range. The standard scientific measurements of the Wood stork are as follows: the wing is 42–49 cm (17–19 in), the culmen is 19–25 cm (7.5–9.8 in) and the tarsus is 17.5–21.5 cm (6.9–8.5 in). The Wood Stork is a broad-winged soaring bird that flies with its neck outstretched and legs extended. It forages usually where lowering water levels concentrate fish in open wetlands; it also frequents paddy fields. Walking slowly and steadily in shallow water up to its belly, it seeks prey, which, like that of most of its relatives, consists of fish, frogs and large insects. It catches fish by holding its bill open in the water until a fish is detected. 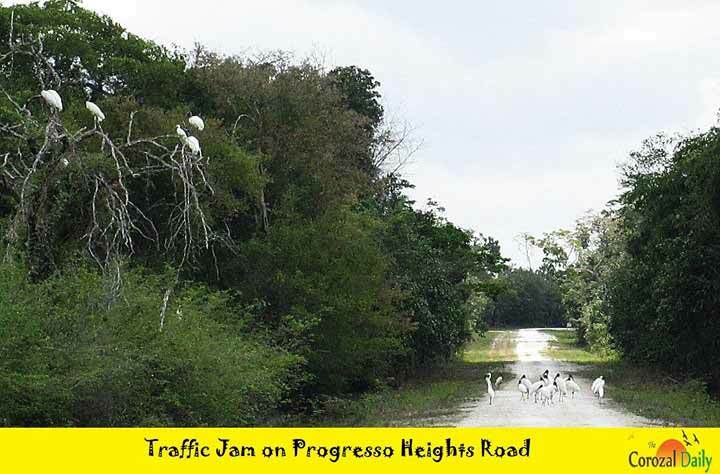 Let's protect our Belizean Wood Storks! The Jabiru Stork which is another stork species in Belize is endangered species and protected by law.